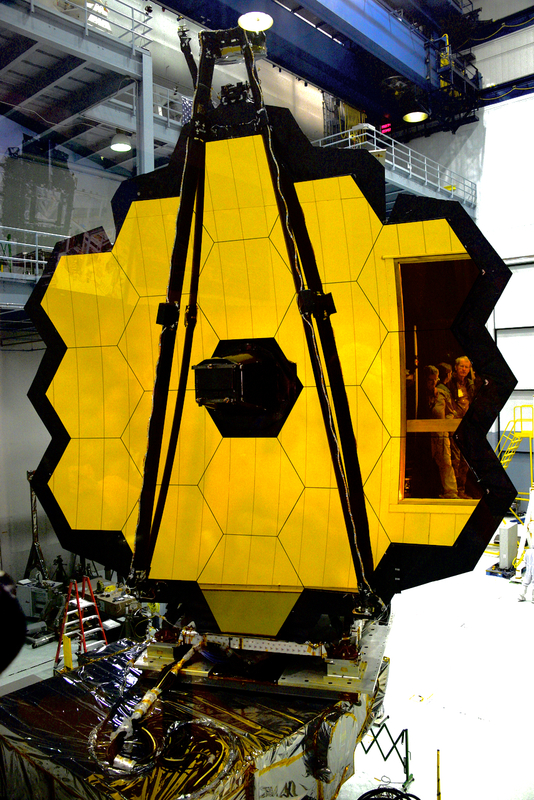 NASA announced today that the launch window for James Webb Space Telescope (JWST) has moved from October 2018 to Spring 2019. The telescope is finishing up cryotesting in Houston and was not harmed by Hurricane Harvey. It will be shipped soon to Redondo Beach, CA for the integration to the spacecraft. Here is a great summary of what NASA plans to do in manned spaceflight efforts in the years to come. I look forward to seeing these plans come to fruition and I hope to see the 1st launch of SLS. Watch the video and read the story to learn about a very critical number in our understanding of the Universe - Hubble's Constant. No matter where you are in the Northern Hemisphere this weekend has some GREAT skywatching in the hours before dawn in the East. The waning crescent Moon, Venus, Mercury, Mars and bright Regulus will all be visible against the backdrop of the wonderful winter constellations. 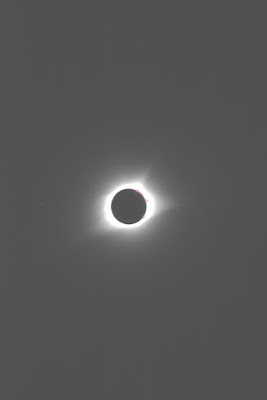 I'M HOPING FOR CLEAR SKIES AND SOME PICS!!!! Today around the world much of the astronomical community is profoundly moved by the impending death of the Cassini spacecraft https://www.nasa.gov/press-release/cassini-spacecraft-makes-its-final-approach-to-saturn. Twitter abounds in Tweets about the intrepid explorer that has been in space almost 20 years and in orbit around Saturn and its moons for 13 years. I am quite sure there are a few wet eyes behind those Tweets for what NASA is calling the Grand Finale https://saturn.jpl.nasa.gov/mission/grand-finale/overview/ . In this computer generated visual Saturn looms ever larger to the Cassini spacecraft as it begins its final plunge into Saturn. At approximately 7:55 a.m. EDT, September 15, 2017, NASA expects to lose contact with Cassini as the spacecraft hits the upper atmosphere of the ringed planet at a blistering 70,000 miles per hour https://youtu.be/AbOf91x2_fs . An explorer to the very end, Cassini will be live streaming its last moments and gathering data with 8 of its 12 science instruments until the thrusters cannot overcome the aerodynamic forces and Cassini starts to tumble, break apart and finally be consumed like a shooting star in the atmosphere of Saturn. It will take 83 minutes for Cassini’s final data transmission to reach Earth traveling at the speed of light - 186,000 miles per second. Almost a billion miles away Saturn and its moons will once again be solitary in their orbit around the Sun. Gone will be the amazing spacecraft that took thousands of photographs, collected Terabytes of data, sent the ESA’s Huygens lander to Titan https://saturn.jpl.nasa.gov/mission/spacecraft/huygens-probe/ and discovered a large global ocean under the thick ice at Enceladus https://saturn.jpl.nasa.gov/science/enceladus/ . Bright Saturn is in the southwest sky after dark. Tonight look at Saturn and say farewell to Cassini. And when ‘The Grand Finale” for Cassini is finally over take some comfort as will I in knowing that the atoms that were Cassini are now part of Saturn. Two NASA spacecraft - Voyager 1 and Voyager 2 https://voyager.jpl.nasa.gov/ - made world-wide headlines recently by celebrating their 40th anniversaries in space. Voyager 1 is about 13 billion miles from Earth and is cruising interstellar space while Voyager 2 is 11 billion miles distant. The spacecraft are healthy and continue to send data back to Earth. They will finally go silent years from now when their radioactive fuel supply is spent. These twins opened up the outer solar system of gas giant planets - Jupiter, Saturn, Uranus and Neptune - as we had never seen them before https://www.jpl.nasa.gov/news/news.php?release=2017-203 . With their respective flybys the Voyagers transformed these giants from what could be obtained through telescopes to up close and mesmerizing personal views. The science obtained filled volumes and the photographs we saw transformed these worlds into actual worlds we had been to. The Voyagers have become cultural icons due in part to their longevity, discoveries and perhaps most importantly of all, the “Golden Record” https://voyager.jpl.nasa.gov/golden-record/ that each of them carries. The late Dr. Carl Sagan was the primary mover in getting these artifacts of Earth and humanity placed on the Voyagers. He also convinced NASA to take the first ever portrait of the solar system which included our Earth https://photojournal.jpl.nasa.gov/catalog/PIA00451 . The famous “Pale Blue Dot” photograph became the subject of a wonderful book by Dr. Sagan. Much of what he wrote is even more meaningful today https://www.goodreads.com/work/quotes/1816628-pale-blue-dot-a-vision-of-the-human-future-in-space . I highly recommend reading it as well as Sagan’s other books. The Voyagers may very possibly outlive humanity as they could roam the Milky Way Galaxy for hundreds of millions of years. Unless they collide with something in space they will be a lasting testament to a species who reached for the stars - and put a Golden Record out amongst them to say, ‘Hello’. Cassini Video - MUST SEE!! Watch this video - it is one of the BEST NASA has produced. I watched it a dozen times - awe inspiring. I will have more on Cassini's fiery end next week. Earth is due to get a solar storm that will likely produce Aurora for the upper latitudes. Check here for details and here for NOAA Space Weather. 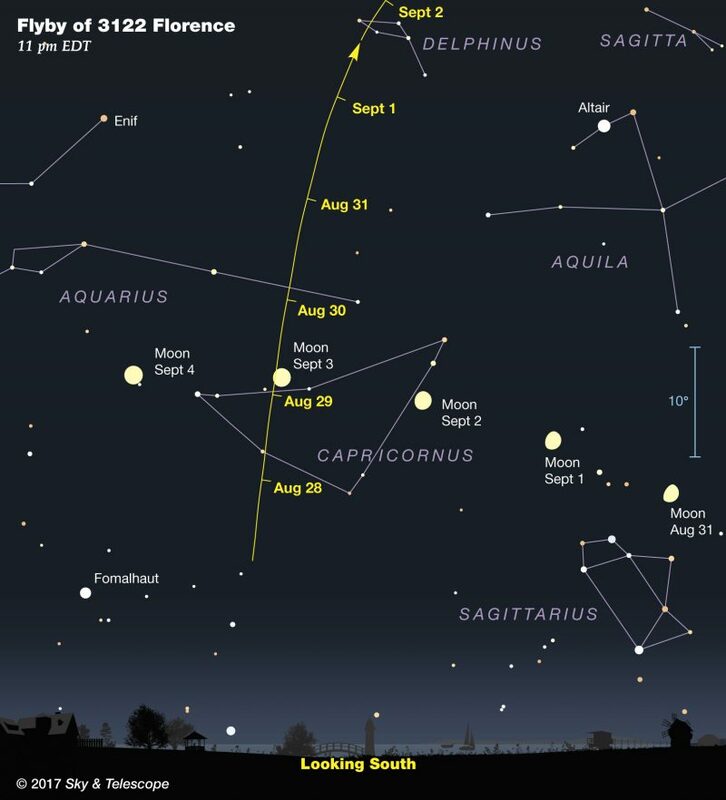 A BIG asteroid, 3122 Florence passed by today at 8:06 a.m. EDT JUST 18 times the distance to the Moon - THAT is a close shave in terms of distance - a little over 4 million miles. 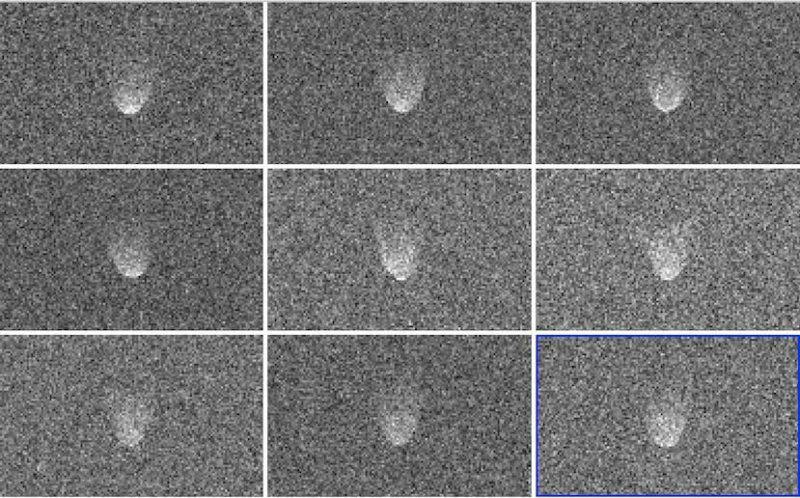 Radar images of asteroid 3122 Florence, obtained from August 29, 2017 via Goldstone Radar in California. Higher resolution radar images expected in the next few days, as the space rock will also be studied from Arecibo Observatory. Image via NASA/JPL. Florence will be visible tonight in backyard telescopes and maybe even binoculars if you know where to look. During late August and early September, the near-Earth asteroid 3122 Florence passes Earth as close as 4.4 million miles from Earth. It will be bright enough to spot in modest backyard telescopes, and possibly binoculars. 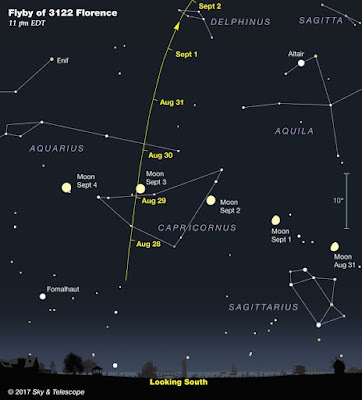 Note that the labeled dates on this chart mark the asteroid’s location at 11 p.m. Eastern Daylight Time; translate to your time zone. 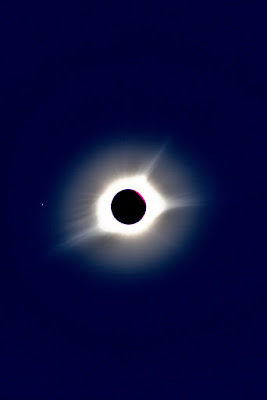 Diagram via SkyandTelescope.com. You can get more details on how to spot Florence here. I will be clouded in until Sunday so I will try to watch the flyby via Bareket Observatory in Israel host a webcast of this asteroid pass on September 1, 2017 beginning at EDT. At at about 3 miles across Florence would cause great devastation to our planet if it were to hit. 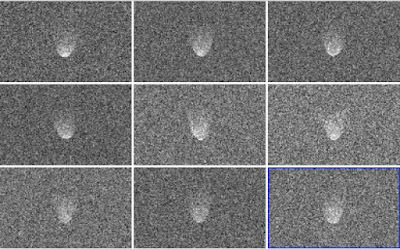 NASA's Planetary Defense Coordination Office tracks Florence as well as other asteroids and comets. We need telescopes and spacecraft to detect and protect our planet from these interlopers. If not, we will go the way of the dinosaurs someday as they were wiped out by a comet or asteroid about twice the size of Florence.